It is a complete 2-channel unit for electrotherapy and electro-diagnostics equipped with two or four 1 MHz / 3 MHz ultrasound heads of different sizes. combination of electro and ultrasound therapy (diadymanic therapy + US, intophoresis + US). The preset programs listed according to the therapies and indications help the therapist to select the optimal combination of the parameters for each patient and/or indication. These features make the Medio MULTISONO the universal device covering almost all applications in physical therapy. The MEDIO MULTISONO is an upgrade to the MEDIO MULTI. 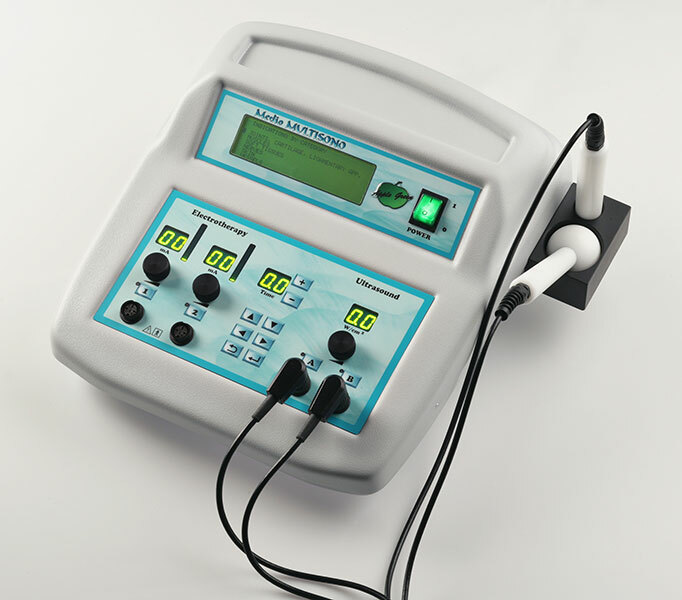 This unique device provides the complete electrotherapy, electrodiagnostic, and ultrasound therapy in a single unit. Diadynamic and interferential currents, TENS, neuromuscular stimulation, iontophoresis, and ultrasound cover almost all applications performed in the physiotherapy office. The 1 and 3 MHz frequency ultrasound heads can function either as electrodes in electro-ultrasound combination therapy, or as a stand-alone ultrasound therapy. MEDIO MULTISONO can be combined with the MEDIO VAC in order to simplifies fastening of electrodes to the patient, and improve the treatment results with simultaneous effect of electrotherapy and vacuum massage.